The Webmin Control Panel has been installed in the Linux server yesterday. Now let’s see how to use Webmin to remote control the Linux server. Actually you can simply use a browser (e.g. Internet Explorer, Netscape, etc.) to log in the Webmin Control Panel to administrate the server easily. By default, Webmin will be installed in port 10000 of the Linux server. 2. Fill in the user name and password. 3. If the user name and password are correct, you should log in Webmin Control Panel successfully as shown in the diagram below. 4. You can now administrate your server easily without typing a lot of Linux commands. The next step now is to add a Webmin account for admin with less power and to add a admin user to SSH into the server. 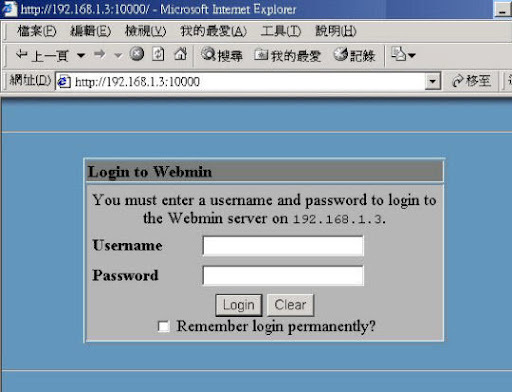 Actually the documentation has a lot of information showing how to use Webmin to administrate the Linux server.